The Neptune Forced Air Cannon can be used for Irrigation and Dust Suppression by utilizing a small irrigation nozzle. The unit is commonly used at compost facilities to dampen piled compost. Maintaining the optimum moisture during composting is critical to cultivating the insects and nitrogen needed to aid in the process. An added advantage is that wetting a turned pile or wind row allows the operator to control the temperature of the pile or wind row and reduces the risk of fire. The unit is outfitted with large nozzles for compost facilities allowing more heavy droplets to fall back over the pile. It can be trailer mounted along with a generator and pulled by a water truck to maintain optimum moisture on long wind rows. The Cannon is also ideal for dust control. When controlling dust, the system is configured with a medium orifice nozzle to deliver the correct amount of water volume. By correctly sizing the nozzle, we can deliver a smaller droplet fall - enough to dampen the surface, but not create a muddy mess. It is also used to raise the humidity in a very specific stream of air where blasting or demolition will be going on. 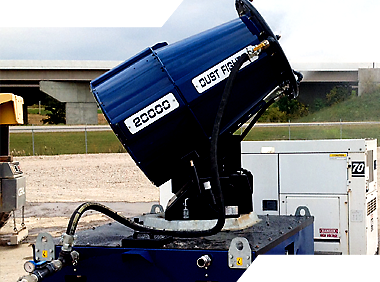 Over saturating the air prior to beginning demolition on blast site reduces the dust clouds that can form over a site. The rings with the various nozzles sizes can be changed so one Forced Air Cannon Unit can be used in multiple applications. The Cannon can also be configured as an Evaporator, relying on a cyclonic air stream versus fixed combustion to convert waste water or leachate into a controllable aerosol. The Evaporator aerosolizes the waste water. As a result, the particles contained in the water within the size range of 30-100 microns “fall out”. The large particles settle in the first 100 to 125 feet from the evaporator and contain all the chemicals, organic materials and solids. The water particles, which are measured at 5 to 25 microns, evaporate immediately and dissipate into the atmosphere. The fallout is easily controlled by directing it into a designated area, either over a lined pond or over any area with a non-permeable liner. All fallout can be captured and returned to catchment tanks for further de-watering through the system. The volume of water is reduced by 95% each cycle. With an operating cost of less than 2 cents a gallon, the process of disposing of leachate by on site evaporation is an effective and affordable method of compliance. As a further benefit, one highly dependable and cost effective system can be utilized in multiple areas for various operational uses by a single skilled operator.